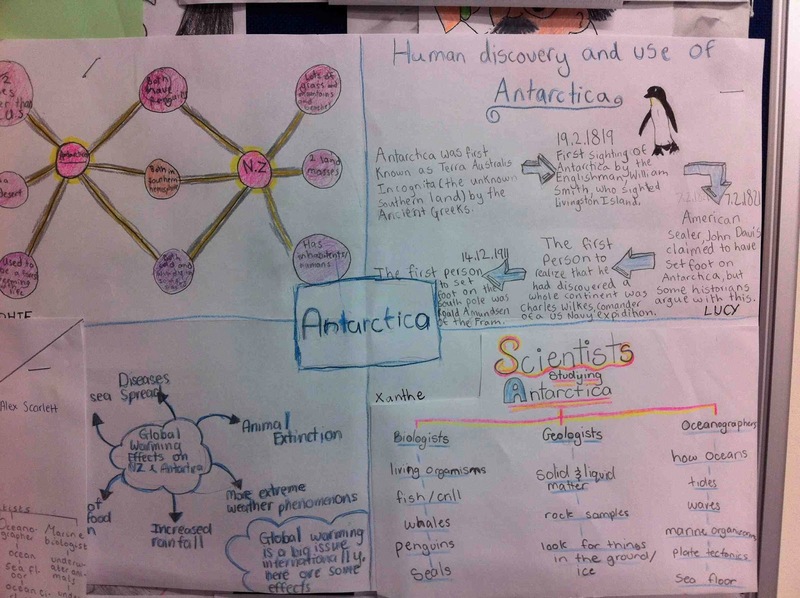 Real science - messy, challenging, convoluted. A long time between posts! Better late than never, however. 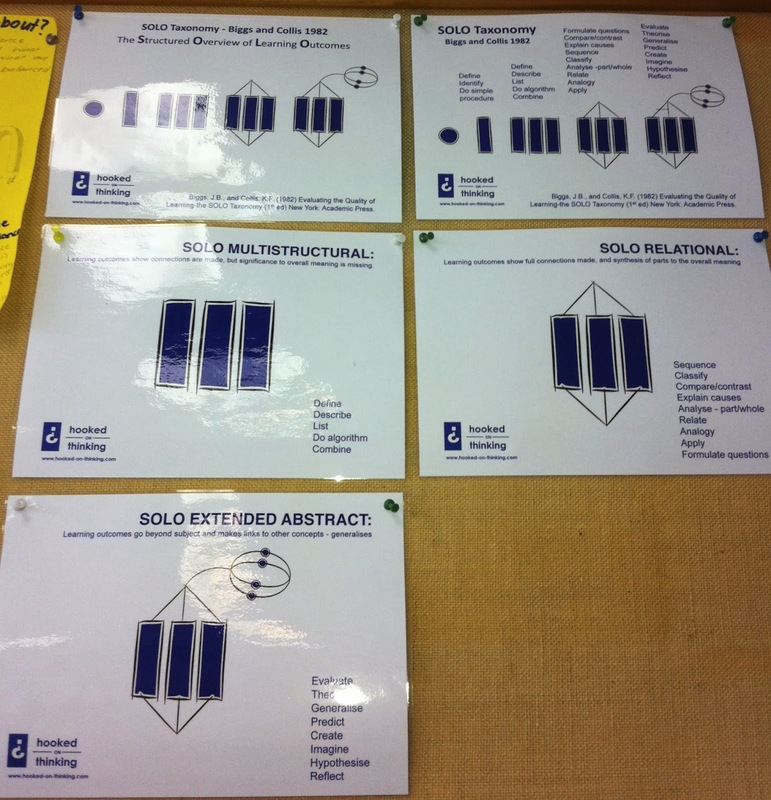 I trialled introducing SOLO taxonomy into Y12 biology as a way of improving student’s ability to answer questions to the correct depth for each component. 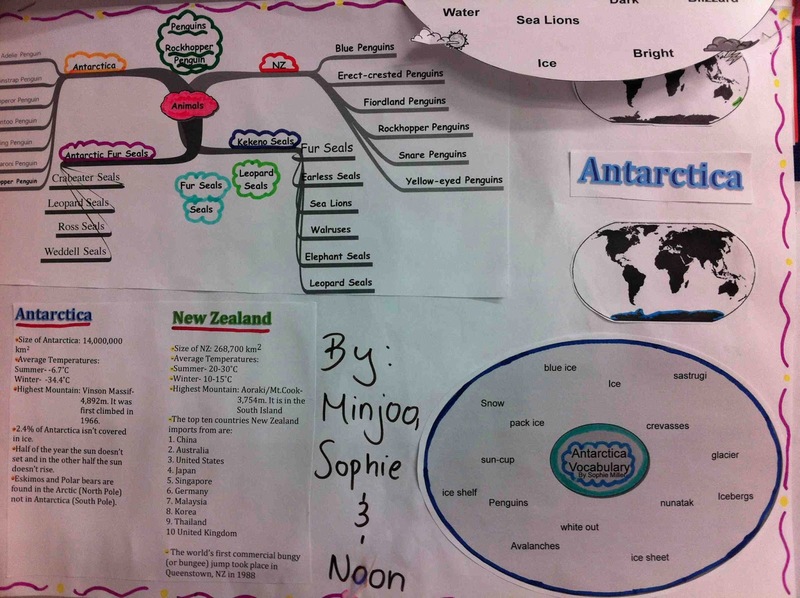 For example, a question on photosynthesis might have the process of photosynthesis under the ‘describe’ part of the question, with the bulk of the answer expected to be about the structure and function of the chloroplast organelles that carry out the process, however students were spending the bulk of their time writing about the process in depth, even though this could only provide an ‘A’ grade for that question. 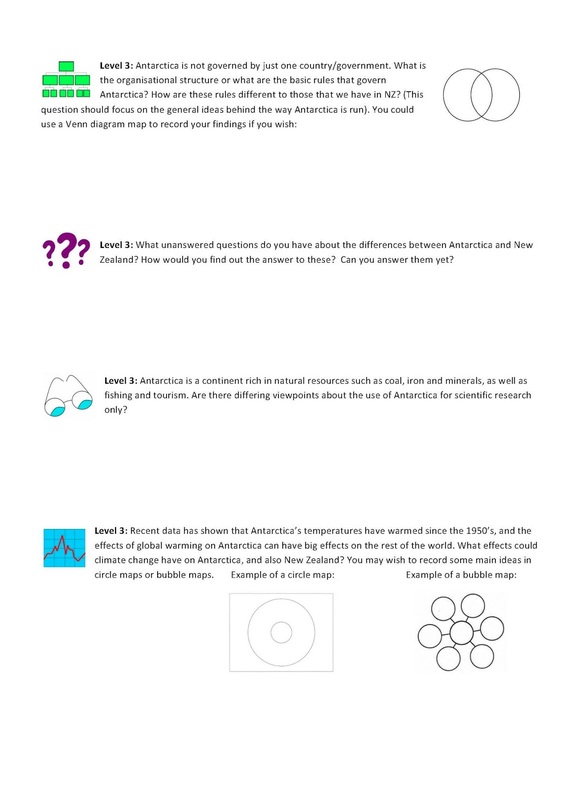 I saw SOLO taxonomy as a way of breaking down the meaning of ‘describe’, ‘explain’ and ‘discuss’ for them, so they could not only write their answers more appropriately to how the question was worded, but also so that they could self-assess and see what level their understanding was at for each part of the various topics. 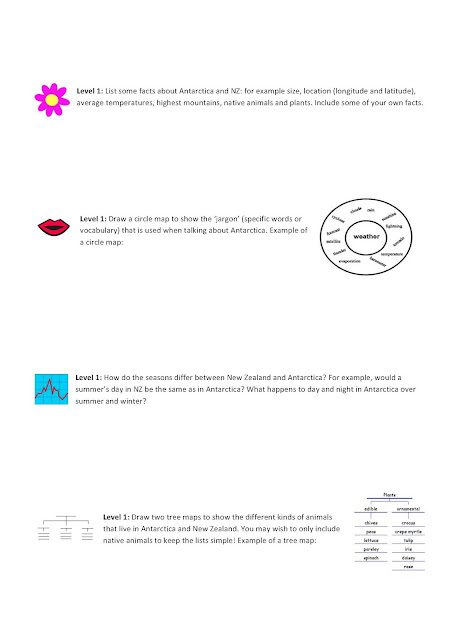 This also easily allowed for differentiation, as students could see which activities were more appropriate for their own personal level of understanding, and what they could do to improve themselves up to the next level. It also was intended to give them a clearer idea of exactly what was expected from them. Student feedback was sought at the end of the year, and the results are below. 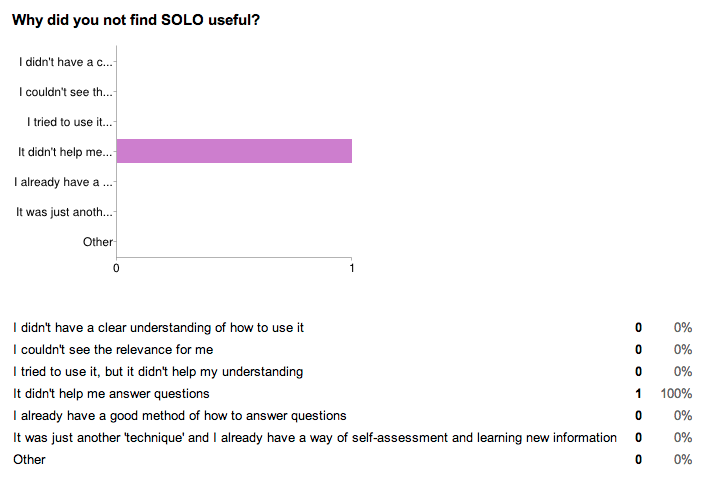 Generally, students has positive feedback towards the use of SOLO, and have said in informal conversations that it has helped them see how to answer questions and self-assess their level of understanding. 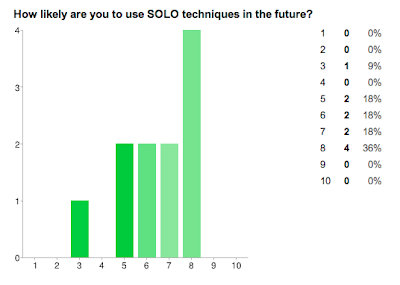 Students were first asked whether SOLO had been useful or not, and then this initial response was broken down as to how and why, and what could be done to improve it. 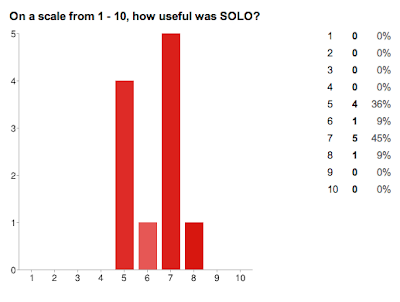 For the one student that didn't find SOLO useful, this is their response... (it is interesting to note that this student is very high-achieving who never attains grades below E). 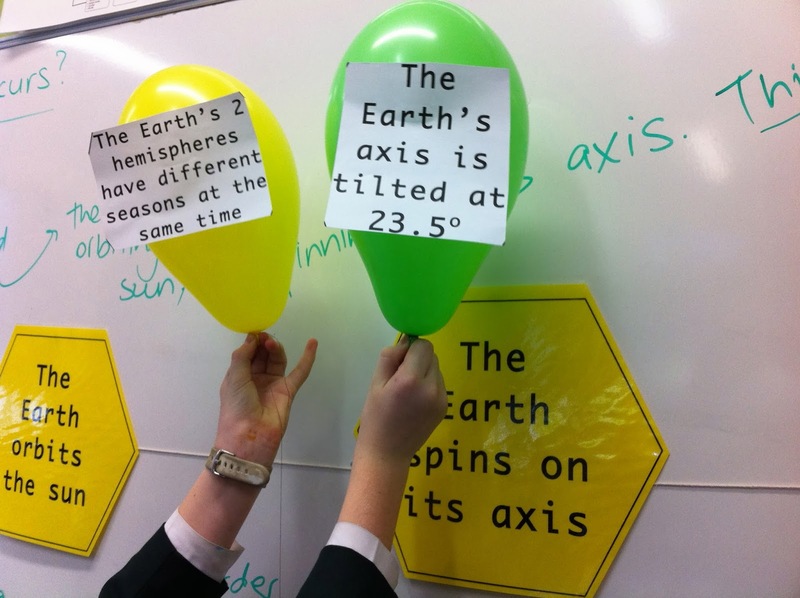 A colleague and I also trialled a more basic idea behind SOLO with our year 8 science classes. We didn’t use the ‘multistructural/relational/extended abstract’ words, but used the hexagons to show how ideas could be linked together, and more importantly that you couldn’t form a discussion without pieces of factual information. Although the data collected was informal, we both noticed an improvement in the way that our students had constructed their discussion questions in a term test, as compared to in the previous terms. 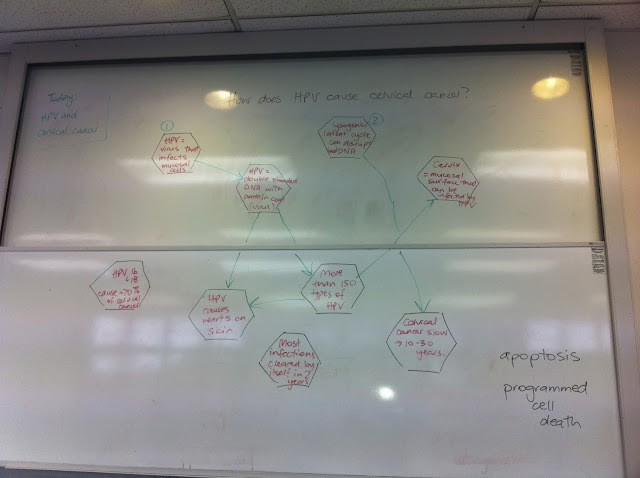 Because it was a one-time activity, it was not possible to follow it up, but the fact that the students found it easy to understand suggests that future incorporation of SOLO techniques into levels as low as Y8 are a possibility. SOLO is tightly linked to the use of HOT maps, although I have tried to get away from that kind of use. My aim has been to focus more on the basic principles behind SOLO, especially focusing on student self-analysis of their own level of understanding; however there is an avenue to be explored at linking HOT maps more closely to SOLO. 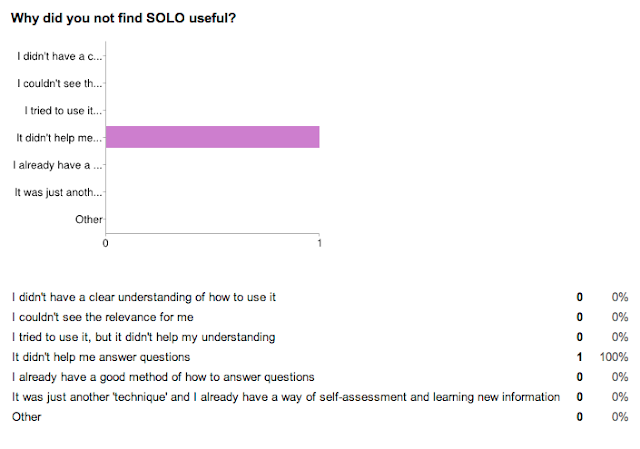 I intend to use SOLO in all of my classes next year to one degree or another – I feel it is more useful for NCEA years, however an introduction at year 10 would allow students to get used to using it, as opposed to having yet another thing to cope with in Y11 and above. Overall, I found the feedback positive. Very interestingly, the only negative feedback was from a student that achieves very highly, and she said that it didn’t help her writing style, as she already innately understands what level to answer questions at. I have always looked at my teaching practice through my research-trained/problem-solver eyes, and only this year have I realised this is a big part of what Teaching as Inquiry is. However, sometimes it's easy to get bogged down in the day-to-day management of classes and workload, and it takes someone else observing your practice to remind and prompt you back into problem-solving mode. I really value my teaching being observed, and try to positively take on board feedback and more importantly act upon it (otherwise what is the point?) I also have to remind myself that while I set high standards for myself, I am just completing my second year out from TCol, and it takes time to incorporate all these wonderful and effective approaches and strategies into my normal/routine teaching practice. A teacher friend mentioned a strategy to me earlier in the year regarding questioning techniques, and while I had such good intentions of incorporating it, I started this term with a couple of big things to introduce (SOLO taxonomy and Edmodo), and this idea was shelved away on one of my to-do lists. Feedback from my latest observation was that while my questioning and discussion with the class was good, I was relying too heavily on the same students to answer my questions and drive the discussions, and there were some students that perhaps felt they could 'opt out' of class discussions because I wasn't calling on them enough to participate. I knew this, but the drive to get through content meant I was taking the first hands up to speed up our progress. This prompted me to introduce the aforementioned technique to improve engagement of all students in my classes, and ramp up the accountability of all students. I asked one of my classes afterwards how they felt about it, and there were positive responses from both my 'usual suspects' and my quiet ones, which was reassuring. More importantly, I have found the engagement level of all of my students has increased, even although it may be by forced accountability, and it's such an easy thing to incorporate into my teaching that I know this is something I will continue to do for every class. I'm a big believer in comfort zones and more importantly, pushing your way through them and into the unknown. I am an introvert by nature, and it is only through forcing myself into situations that I'm not completely comfortable with that I have really grown as a person. My self-confidence has been boosted, I've done things and gone places I never would have imagined. 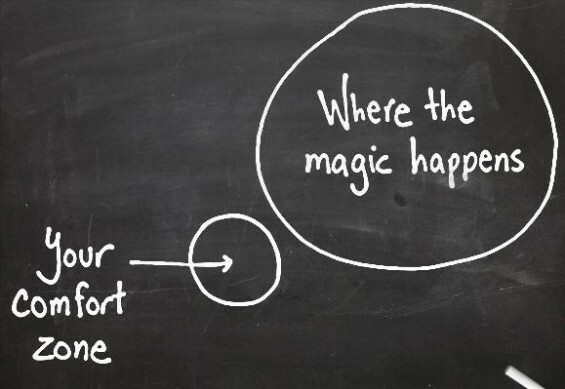 So yes, leaving the comfort zone is good. However, I was recently at a gathering of Educators, and someone brought up the idea that our students should always be slightly uncomfortable in class so as to learn more effectively. This completely challenged my idea of how I aim for my classroom environment/vibe to be. My initial response was to think: No! Students need to feel comfortable in order to ask those questions they think other people may not value, and to believe that the other people in the room will support their learning. How can you really believe that as a student if you are feeling on edge and have different (stress?) brain chemistry going on? Was the person suggesting that the uncomfortableness should come from the environment of the classroom, or more from the content/thinking/context? And then I took a step back and really tried to challenge my own thinking (it's quite a confronting thing to do!) Perhaps my reaction was solely based on my own personal experiences of the difference between choosing to go outside my comfort zone when I felt it was required by the situation or by some inner drive, compared to when I was forced outside my comfort zone by other people's actions. Also by what my different reactions were based on how far beyond my comfort zone I went. I enjoy and thrive on my experiences when I have chosen to let go of those things that are familiar and safe, but I can feel resentful, annoyed and on edge when other people make that decision for me. But maybe that's not the case for everyone? Perhaps I even misinterpreted what was said, or what the intent of the statement was? However, I realised that feeling comfortable on a personal level is completely separate to the kind of environment that my brain best functions in. My research suggested that learning best takes places in a zone somewhere between comfort and panic, called the learning/stretch zone. So, I am grateful for views that seem to oppose my own, because firstly, life would be so boring if we all thought the same way; and secondly, when I use these opposing views to challenge my own thinking (rather than just dismissing them out of hand), it opens up doorways into learning about new aspects of my own practice. In this case, although I initially disagreed with what was said, that "students should always feel a little uncomfortable", I really just needed to clarify and expand my understanding. From a biology perspective, when animals are in threatening situations, the adrenaline starts pumping, heart rate increases and a lot of other physiological factors come into play which result in a stress to the body. Life is stressful enough for teenagers! They don't need a stressful classroom environment on top of things... so the push into the learning zone needs to be a gentle one, where they feel supported, but their thinking is stretched and challenged. The fluoride debate in the media at the moment (in relation specifically to the Hamilton council deciding to remove fluoridation from the city water supply) has reminded me why we as science teachers have the potential to play a vital role. It is not enough to simply teach pre-determined science content to our young people any more. We must teach them the skills to be scientifically-minded, responsible consumers of digital technology. We must teach science to them in authentic ways that resonate with them, and make a difference in how they view the world. It is not enough to teach them as if we lived in (as I call it) "perfect science land" where every experiment works and all theories are apparent and obvious, and nothing is laborious and repetitive.... and you simply have to persevere until your research provides the long-awaited-for fruition. They need to see a glimpse of what 'real' science is like and that good research and scientific findings take time and effort. These students have a huge amount of content and resources at their fingertips, but we have to provide the context of the content and show them how to use the skills to best utilise the content. These are young people that have grown up as digital natives, surrounded by the internet, and yet for the most part these young people do not approach the constant flow of information they receive with caution or wariness; it seems more often that they blindly trust anything their friends link to on facebook. Recently, in a class discussion on nutrition within a Human Body unit I was doing with a year 10 class, a student earnestly told me that fast food was bad because (wait for it!).... they put fish genes into their chicken burgers. What's worse is that no-one in the class questioned the statement - they all looked horrified and were no doubt gearing up to tell more of their friends later. Now I grew up with urban legends about fast food outlets, but they remained just that - urban legends. With the internet now such a omnipresent force, these once urban legends spread (and these 14 year olds are not exactly checking on snopes.com first!) and become somehow more believable because they are on a website somewhere. Regardless, it is our role as science teachers to guide these impressionable students into becoming scientifically-minded, objective (and dare I say, slightly cynical) thinkers. They need to understand the difference between sciencey-sounding writings on a random blog and the scientific findings published in a peer-reviewed journal. They need to be able to take a wide-range of information and draw their own well-thought-out conclusions. In this age of instant gratification, the correct answers are not always the ones we come to first, and real science can take time and deep thinking about issues. I want my students to leave school with the ability to question material that they read; to ask the why's and how's; to take their time in coming to a truly informed decision - one where they have considered both sides of an argument and looked deeper for the real science behind the presented facts, an informed decision where they see where the bias and vested interest is and take that into account, an informed decision where they look past the pseudoscientific language that is so often thrown around and in reality means nothing. They also need to have the basic knowledge to interpret those findings, to understand what the language means and to know where they can go to reliably further inform themselves. I want my students to be informed, responsible consumers of and contributors to the internet age and to make scientifically-sound decisions based not on the random ramblings of someone who is inherently anti-science and pro-conspiracy theories. To give them an insight into the efforts and diligence that go into science research. And to me, that is where the future of teaching science lies. Further thinking: I want to clarify that I still believe there is a place for science content being taught - there are so many aspects of science that need to be explicitly explained and demonstrated so as to avoid the misconceptions that students so often have, and teachers are in the position of being able to see where to build the scaffolding and how to allow the students to understand. However, this alone is not enough; we must teach them the skills and context to properly understand and value the content, and more importantly, we must teach them to question the content, including what we teach them! 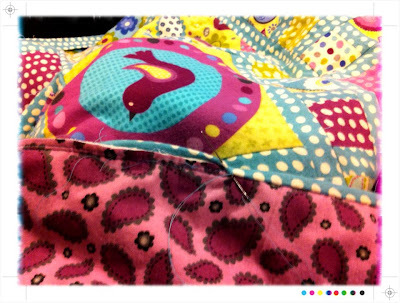 2 years ago, I taught myself to make a quilt. 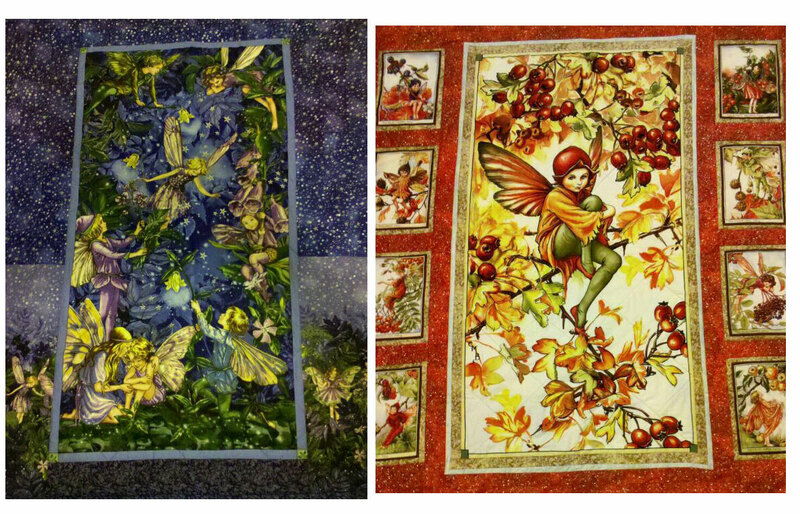 I was so excited about choosing fabric, learning everything there was to learn (what would we do without youtube clips?! ), picked out matching thread and then finally had everything together. I had very limited and basic sewing skills going into it, and a sewing machine I had barely used, and my knowledge from the internet was rather sketchy...... so why was my first attempt reasonably successful, and why have I gone on to make more of these (sometimes very large) quilts? The interest and pride I had in taking on this new project was so intense that no matter how many mistakes I made, I had the self-perseverance and motivation to keep going and see what the final product was. 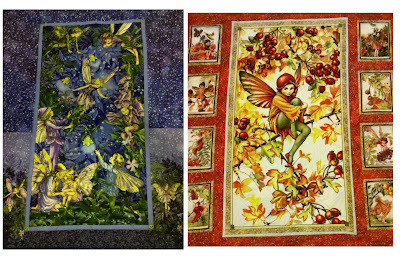 I often ended up wasting fabric, and having to re-cut when I didn't follow the instructions properly, and when I sewed things in the wrong place, I chose to partake in what I not-so-fondly call 'backwards' sewing and did it all over again, in the correct place. 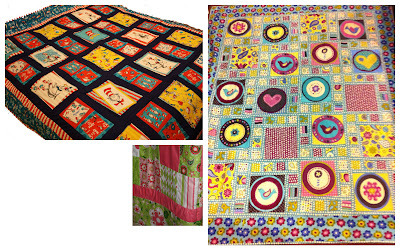 Sewing, in particular quilting, is one of my happy places, and even when I'm amazingly frustrated when I stuff up, it doesn't take my enjoyment away because I know how happy and proud I will be with the final product. Stay connected on twitter and through as many face-to-face activities as I can with positive, self-motivated, progressive, forward-thinking teachers. I need to keep my levels of inspiration up! Ensure that during my planning, I make the utmost effort to incorporate some of the previous ideas and strategies into my classes; in particular I want to change my comfort zone/fall-back from ‘chalk and talk’ to students having more voice and taking control of their learning through differentiated activities/instruction and project-based learning and through challenging their thinking. Allow more time for students to reflect on their learning, including the emphasis and use of SOLO taxonomy for student’s own use. 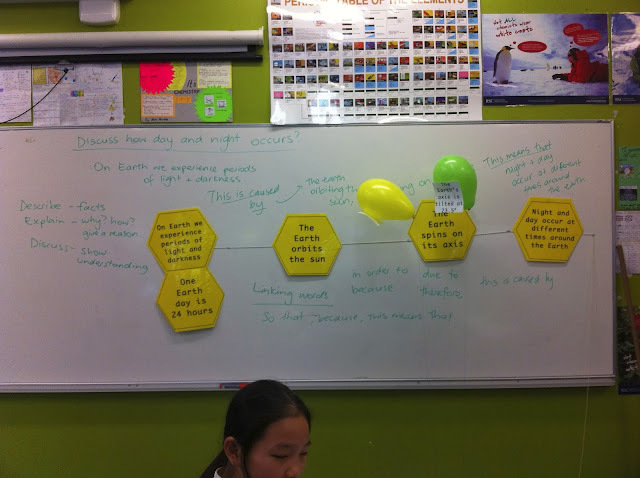 Encourage students to take own notes and make own summaries, and work collaboratively with other students to extend knowledge rather than a more one-way transmission. Start each lesson or concept with why the students should learn about it, rather than the what or how. Be aware and purposeful in the strategies I choose and approaches I use, and reflect critically on their success. Big picture/blue skies ideals – keep these as my goals and continue to reflect on any progress I make towards them. Blogging my trials and tribulations will help me keep track. Time given to each unit/standard is restricted. My personal preference would be to do fewer units/standards over the year, giving more time for each unit/standard, but this is not something that is negotiable. The department (or NCEA) – wide learning objectives still need to be covered within each unit, for an end-point of tests and exams which must be sat by all students. Increase the use of project-based learning within units/standards. 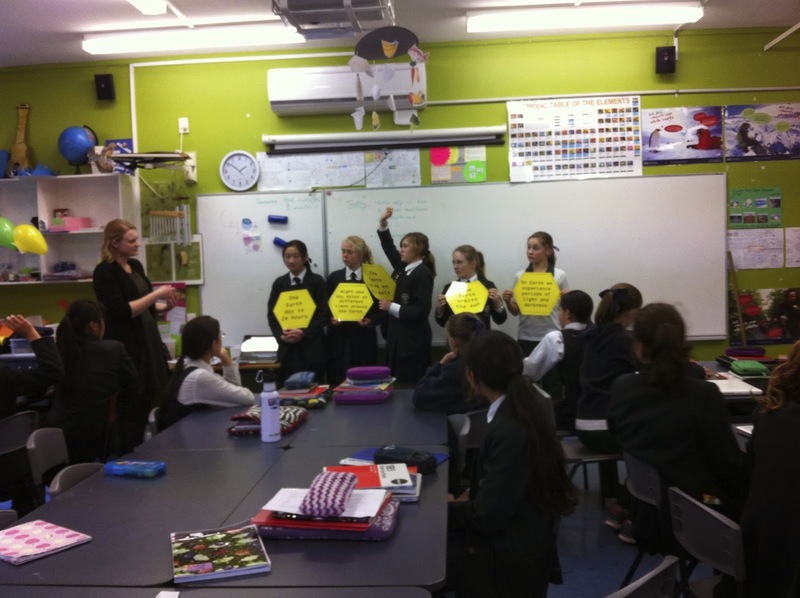 Give a choice within units for the junior science classes, to increase student voice. i.e. for mini-projects, let them decide own topic within a range. Increase opportunities for self-directed learning where appropriate. i.e. students can spend more time on the areas they need to rather than a one-size-fits-all approach. This also ties into increasing vertical differentiation within class. Decrease number of worksheets I give to students, and instead give them a context and some scaffolding to apply their knowledge to. 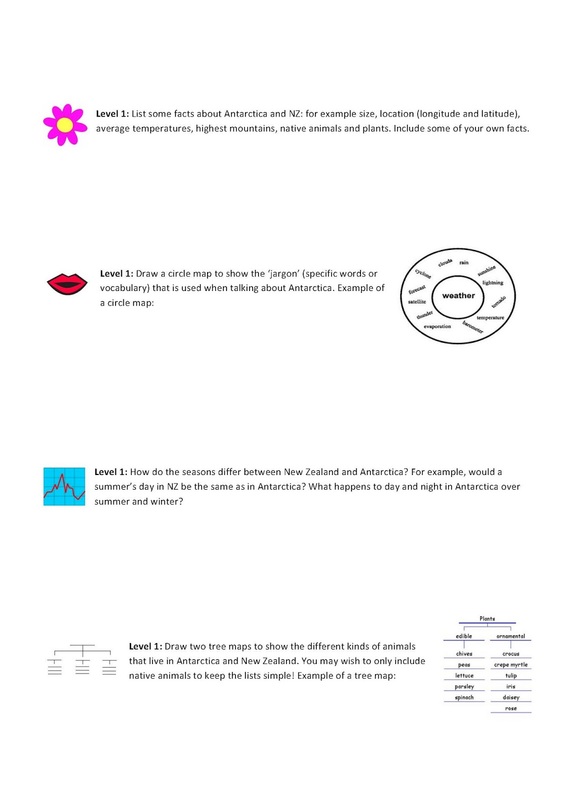 However, there is still a place for starting with shorter answer-type questions before building up to the large open-ended essays expected in biology NCEA. Give students more chances to be creative (after all, science and creativity go hand-in-hand!). The number of standards and units within each year is fixed – this links into the time constraints also. 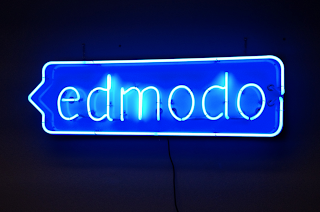 Emphasis in the school is on high achievement, and traditionally quite prescriptive learning has taken place, with a tendency to ‘spoon-feed’ students the ‘correct’ answers, rather than giving them a chance to figure it out for themselves. Aiming high is great, I don’t want to change that. It is so important for students to set goals, and for them to believe that they are achievable. It is also vital that they know their teachers believe in them too. I want to breed resilience and resourcefulness in my students, and giving them all the answers all the time isn’t going to aid that. I need to increase opportunities for students to discover the information for themselves (and I will act as back-up, making sure they have the information they need, and they can apply it to the right contexts. Give the students some opportunities to fail. i.e. set up experiments that can’t work. Then talk about how that is ‘real’ science, not pretend ‘science-land’ that I often refer to in class – i.e. 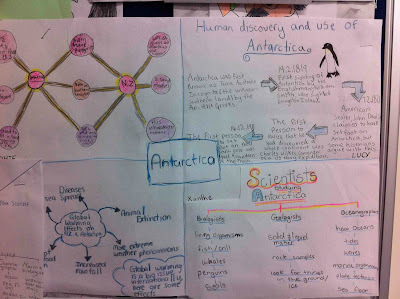 everything is concrete and we know all the answers-type idea some students believe that science is. Continue to incorporate real science – allow students (especially in NCEA classes, particular L2 and going forward L3 biology) to understand that some of what they learn is on the cutting edge of science and research; many of the questions that arise from some of these topics such as epigenetics are unanswered. Incorporate use of SOLO taxonomy so that students can reflect on their own learning, and determine where and when they need to put more effort into their learning. Continue to be transparent in my teaching, modeling thinking strategies and also making any mistakes I make obvious and an important part of learning. Being a co-operative and productive member of the team is important to me, and I don’t want to rock the boat so much that it creates problems for other teachers. I want my students to have the same opportunities and experiences as other classes, and to reassure their parents that I am doing a good job of teaching their children. There may not be as much room for incorporating student voice as to what they learn, but there is some for how they learn. 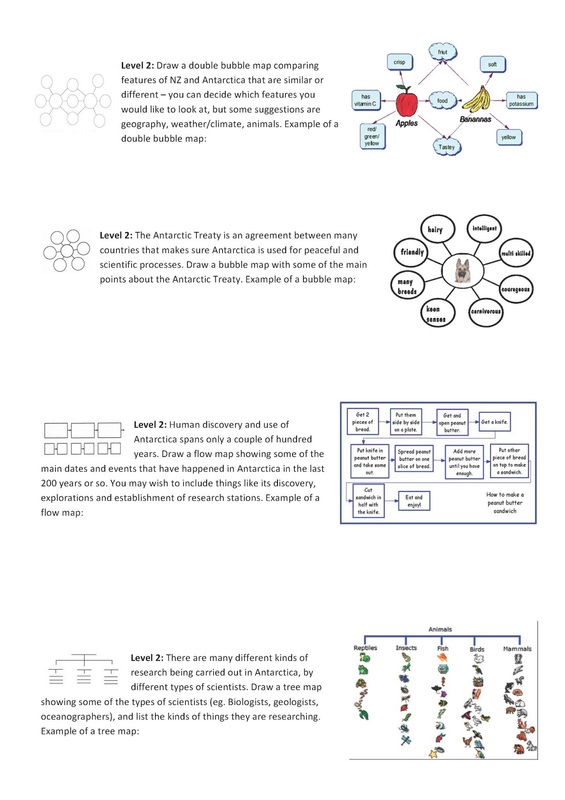 I could tweak notes/handouts that I give to students so they are not as prescriptive. (This may be harder to implement as notes are given on a departmental basis). There is more flexibility in certain classes – i.e. years 11 and 12, and also 8 (although year 8 students may not have the right background just yet to be able to effectively drive their own learning? For science in particular they may need close guidance as to the vocabulary and content, as at this age it is very easy to develop misconceptions in science if these are not made explicitly clear). Explore the flexibility in the classes that I can – I can see space to do this already within year 12 biology, and year 11 science. Give these students more options as to how they learn, and expand the aspect of vertical (and also horizontal) differentiation within this. Incorporation of vertical differentiation and personalised learning into these ideas/goals will be easy, in particular the last point. Harder to implement in NCEA classes, as the content is mostly from an external source, but I could still ask students for guidance as to what they would like to spend more or less time on, and whether they have interests in expanding their knowledge beyond the standards in certain areas. Ideally, they should be co-constructing their personal course with input from me, to maximize their potential in terms of how many internals and externals they should be sitting, and as to where their interests lie. 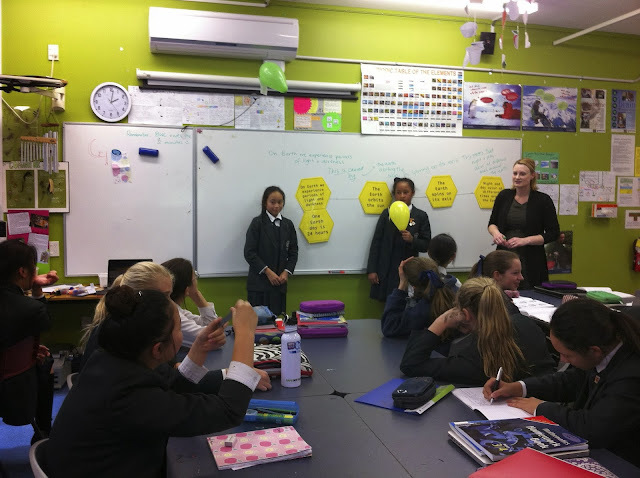 Junior science classes – ideally they should be designing the units with me, giving a large amount of input as to where their interests are, and letting me weave those interests and passions into the context of the curriculum. In a way that it complements what they are already doing, rather than being something that replaces it. 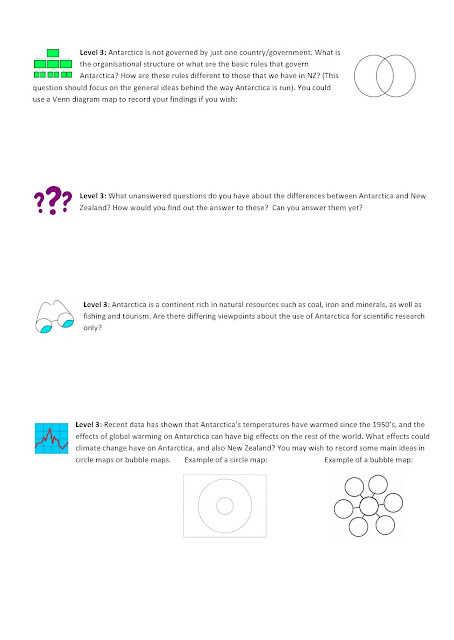 Expand how students are already using their phones – recording experiments for example, and getting them to present their own findings back to class via class wiki or presentation? Utilise MPower more and simplify it, to make it easier for students to access (and choose to access) materials on a per lesson/per content basis. Is there a way of extending MPower so I am using it as the full potential to allow bi-directional (or multi-directional!) info transmission? Expand use of class wiki’s already set up, as a way for students to help each other out, rather than a one-way transmission of info. More time to really explore their learning. This would mean flexibility in the planning of units, and the ability to expand or contract aspects of the content where the students desired it. 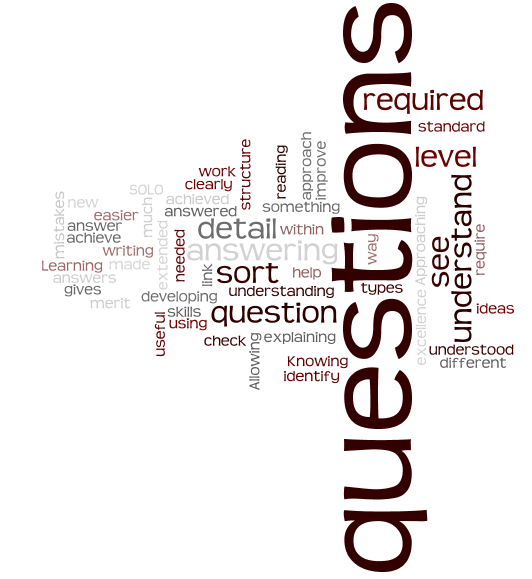 Obviously for NCEA classes, the content needs to be covered for both internal and external standards, but ideally in a flexible programme, students could choose which AS they would sit (within the parameters of sitting adequate credits for the course), and therefore perhaps have more time to give to deepening and extending their understanding, thereby increasing their achievement in the standards they do choose to enter. More to come no doubt as I further explore my teaching practice! ‘Lord, strengthen my faith to depend on Your perfect timing for my life’. Now, as previously mentioned, I am not a religious person at all, but I strongly believe in karma, signs and making meaning out of things (to a degree, given my training as a sceptical scientist! )… this was followed up a day later with a very inspiring conversation with fellow TCol-now-teacher buddies, and also that I followed the advice offered at ignition to finally join up with twitter (something I had been avoiding due to already stretched-thin ‘free’ moments – really no such thing as free moments when working fulltime with 2 preschoolers!). improving/tweaking your practice is not enough; you need to transform your classrooms. From a professional point of view, I am ready for that, but now I am wondering how do I sustain that goal, when next term resumes, and life gets back to normal, and I don’t have the blue-skies inspirational people to listen to every day? I’ve broken it down into what my overall goals and ideals are, what my current contexts are, and what strategies and goal-setting I can use to help me stay on track, and have a ‘bias towards action’ as was suggested at ignition 13.